Gender, leadership and governance: what did we learn from the World Health Summit? 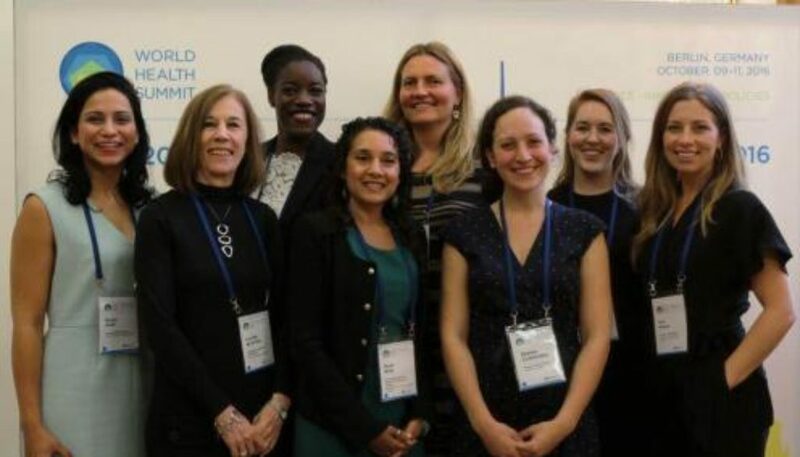 This blog discusses lessons learned at the World Health Summit in response to gender, leadership, and governance. Governance is a core pillar of health systems – if we are to strengthen health systems and meet the gender and health related Sustainable Development Goals greater gender parity and gender responsive, transformative leadership are essential. Around the world, most health care is provided by women; in paid formal roles and in terms of unpaid caring work within households and communities. Given this, it is ironic that the vast majority of key decision-making posts in health – ministers of health, donors, and heads of health research institutions – are male. So too are the speakers at many international conferences on health, leading to the growth of the social media campaign to shed light on this: congratulations you have an all-male panel, adorned with a photo of David Hasselhoff. Within research there are numerous tools and guidelines available to promote gendered approaches in health systems research, including in governance and leadership. These promote the gathering and use of data to address gender inequities at different levels of the health system and can support leaders in promoting gender-transformative governance processes. They can also be used to promote attention to gender, for example in developing and assessing funding proposals, the design of programmes and in supporting peer review of papers. Technical tools will only get us so far, because changing gender norms and relations is an inherently political process. The need to also engage men and boys in promoting gender equity in governance was a clear and loud call from participants. Engaging meninvolves a careful assessment of power relations and sustained efforts to ensure that this is done on a partnership and equality basis. This is the focus of the HeForShe campaign for example. Niyati Shah from USAID explained how forging relationships with male and female religious leaders and discussing the importance of rights have led to successes in raising the spotlight on, and reducing, female genital mutilation in some contexts. Participatory research processes which build on feminist theories and engage different constituencies in research processes can also support change. As highlighted by this work to address maternal mortality with community leaders in South Sudan. Whilst there can be considerable challenges to making change, as powerful people are invested in the status quo, it is heartening to remember that gender roles are not static – they are fluid and amenable to change. Something better is possible. Gender shapes the functioning of health systems at international, national, subnational and community levels and each level impacts upon each other. Leadership is not just about who heads the UN, is Minister of Health or Member of Parliament, but also about leadership at the local level. Temitayo Ifafore discussed gender, leadership and human resources for health at different levels of the health system. We need to extend the gender lens within leadership to include people like community health workers, who provide a vital interface between health systems and marginalised communities, as their interactions and room for manoeuvre within these communities can play a role in promoting gender equity. Intersectionality has much to offer us in our analysis of gender and health. A key focus of the World Health Summit was refugees and the need for much stronger, political, and cohesive action here (yet another opportunity to be saddened and embarrassed by BREXIT as we in the UK appear to opt out of much of this). Speakers presented about the toxic discourse on migration and impacts of xenophobia, trauma, precarious migrations, and detention and how this plays out in different ways in the health of migrants. Gender transformative leadership, which seeks to address questions of poverty, inequality and social justice in Europe and beyond, requires investment and development of appropriate services for migrants and refugees and other marginalised people. Empowerment of women – There is a need for policies to increase women’s life choices, strengthen the right to modern family planning, focus on ending gender-based violence, and encourage greater recognition of women’s labour, both paid and unpaid. Right to health for refugees and migrants – There is an urgent need to support the movement of refugees and migrants, including the reinforcement of legal frameworks to protect refugees and commitments to the safety, dignity, and fundamental freedoms of all migrants. Resilience and global health security – Collaboration between the G7, G20, and UN is needed to support health security, and solidarity is critical. The forthcoming Global Symposium on Health Systems Research has a strong focus on gender, intersectionality and crisis and fragility. Follow some of what RinGs and ReBUILD is doing via the links below. This blog was originally posted on the HSG website.